The 1961 Fender Twin Amp... The Vibrato in this amp was actually more than Tremolo. I am not sure exactly what the effect should be called. Vibrato? Tremolo? Modulated dual filter? Phasor? Leo called it “vibrato” which isn’t technically correct. It is an amazing sound though!! Truly the “sinewave” Brownface tremolo sound, folks are looking for. We used this as the starting point adding a lot more range of speeds and much more depth. 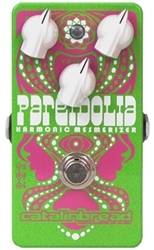 Like most other Catalinbread pedals, the Pareidolia was designed for both 9v and 18v operation, the latter giving a more pronounced up-front sound to the effect. We worked very hard tuning this pedal, and the result is a complex modulation that is quite literally a mesmerizing effect, where you stop thinking and just start playing. It frees your mind to be creative. It is hypnotic, yet unlike over the top modulation effects the Pareidolia doesn't pwn your sound, allowing your playing to shine through. And unlike other modulation pedals it is less picky in its placement with other pedals. Whether the Pareidolia is placed pre-dirt, post-dirt, or sandwiched between, this pedal still sounds great. We're convinced that once you turn on the Harmonic Mesmerizer, you'll have a tough time turning it off. Here's a fantastic clip to wet your whistle, showing the Pareidolia's range both clean, and through a cranked amp. Your guitar signal is split into two. One feeding a gain stage filtered to pass highs and the other filtered to pass lows. These stages are tuned to share some common frequencies in the middle so when it modulates they have a nice swirly soup in the midrange. The amplitude (via bias) of each stage is modulated by a sinewave out of phase with the other. The result of this is as one stage’s volume is going down the other is going up. The fact that it is modulated by bias means the phase of each stage is modulated ever so slightly. The interaction of this slight phase shift on the shared midrange frequencies results in some interesting subtle frequency canceling while the amplitude goes up and down. So what you hear is quite literally mesmerizing. Your brain has multiple points of modulation to listen for, phase shift, amplitude, and frequency band. When you play a held out chord your brain hears things that is not actually happening, such as the LFO sometimes seems to be speeding up and slowing down. In reality the LFO is staying the same speed, but because the sound is so complex your mind is attempting to make sense of all the variables. I liken it to seeing faces in clouds, in wood grain, or on Mars – thus the name Pareidolia. Replicates early 60's fender "harmonic" vibrato. A unique effect mix of tremolo, vibrato, phasor, and filter. Extended depth and rate for more sounds and speed. Roll back Depth to double as a clean boost.